Westminster strives to keep those within our church family, in the local community, and in the world beyond informed of the latest in worship, music, mission, Christian education, special events and more. Our newsletters, bulletins and annual reports are available online as a convenience to our website visitors and to demonstrate our efforts to reduce paper consumption. Get a full-color look into the latest happenings! Download issues from the past year of our monthly newsletter filled with colorful graphics and inspiring details. If you would like to submit an article for The Westminster Chimes using our easy online form, just click the button below. You may choose the online "viewer" or the direct PDF. Please select the option that best suits your needs. 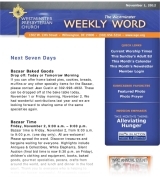 The Westminster Weekly Word is our weekly e-newsletter distributed every Thursday afternoon. It consists of short, simple blurbs designed for quick reading. Check out our most recent edition below, and sign up for our e-newsletter by typing your email address in the orange box to the left. You may submit an announcement using the button to the right. 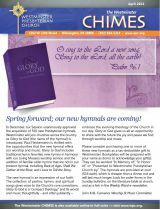 We keep a six-month archive of our worship bulletins for referencing past worship services or looking ahead to the coming worship service. The bulletin for the upcoming Sunday worship service is typically posted by 12:00 p.m. on the Friday just prior. April 7, 2019 9:00 a.m. 11:15 a.m.
March 31, 2019 9:00 a.m. 11:15 a.m.
March 24, 2019 9:00 a.m. 11:15 a.m.
March 17, 2019 9:00 a.m. 11:15 a.m.
March 10, 2019 9:00 a.m. 11:15 a.m.
March 3, 2019 9:00 a.m. 11:15 a.m.
February 24, 2019 9:00 a.m. 11:15 a.m.
February 17, 2019 9:00 a.m. 11:15 a.m.
February 10, 2019 9:00 a.m. 11:15 a.m.
February 3, 2019 9:00 a.m. 11:15 a.m.
January 20, 2019 9:00 a.m. 11:15 a.m.
January 13, 2019 9:00 a.m. 11:15 a.m.
January 6, 2019 9:00 a.m. 11:15 a.m.
December 23, 2018 9:00 a.m. 11:15 a.m.
December 16, 2018 9:00 a.m. 11:15 a.m.
December 9, 2018 9:00 a.m. 11:15 a.m.
December 2, 2018 9:00 a.m. 11:15 a.m.
November 25, 2018 9:00 a.m. 11:15 a.m.
November 18, 2018 9:00 a.m. 11:15 a.m.
November 11, 2018 9:00 a.m. 11:15 a.m.
November 4, 2018 9:00 a.m. 11:15 a.m.
October 21, 2018 9:00 a.m. 11:15 a.m.
October 14, 2018 9:00 a.m. 11:15 a.m.
October 7, 2018 9:00 a.m. 11:15 a.m.
Each year, Westminster publishes an annual report as an overall summary of our programs, spiritual growth, and finances.